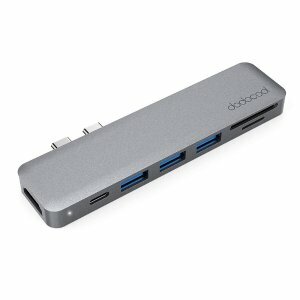 Amazon.com offers the dodocool Aluminum Alloy 7-in-1 Multiport Hub 50% off for $24.99 via coupon code WBMKYC28 . Built with the aluminum alloy case, it is specially designed for 13.3-inch or 15.4-inch MacBook Pro (2016 / 2017). Enable you to connect up to three USB peripherals to your MacBook Pro (2016 / 2017) simultaneously and transfer data at up to 5Gbp/s. Backwards compatible with USB 2.0 devices. Support USB 3.1 Type-C throughout (up to 10Gbps), 4K (3840 x 2160 @ 60Hz) display connectivity, and charging for your MacBook Pro 2016 / 2017 while connecting to a USB-C power adapter. Mirror or extend the display of your MacBook Pro 2016 / 2017 to your TV, monitor or projector in up to 4K UHD (3840 x 2160 @ 30Hz) resolution through the HD output port. Backward support 2K / 1080p / 720p / 480p / 360p resolutions. Enable you to easily access files from an SD card and / or a TF card directly. Support SD memory cards and TF memory cards of up to 512G. Slim, thin and compact. No driver required. Plug and play. Support hot swapping function.